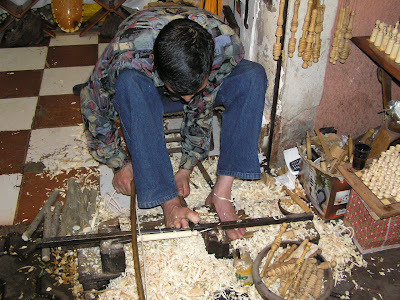 A bow lathe turner in Marrakesh - photo taken by my friend Daniel Melman from Israel. Hopefully the video is uploading to YouTube at this moment . . .
We have laughs and tears actually shooting these films. Then we quite like clipping and cutting and pasting and twiddling the bits into something that looks reasonable and isn't too long. We're thinking of developing these films, making them longer and more informative . . . This is Prince Harry's body double, Ben Orford, trying to trim his toenails on my bow lathe . . . The real Prince Harry having a go on Lois' lathe - can you imagine having your first lesson on a pole lathe under the glare of all those flashlights ? More pictures coming when I've had a chance to check them out . . . Here's a couple of Robins learning to use the bow lathe . . .
any captions for this shot of Rob Wood . . . ? We had a great time at the Royal Norfolk Show, (apparently it's the biggest and most important country show in the Land) - right up to the end even when it poured with rain all the way home and we had to unload the truck in the heavy rain late at night !! We have spent the day recovering. We met lots of friends, old friends, new friends and had a good chinwag with other like-minded and interesting folk. There was a tantalising atmosphere pervading our Woodland Craft glade. When leaving my fellow artisans and going into the main showground for water I felt like I had been dropped into Oxford Street on a mad, Saturday afternoon ! We will be demonstrating at The Royal Norfolk Show on Wednesday & Thursday. There is a Woodland Craft area with the hurdle makers, basket makers, willow weavers, coracle makers, bodgers etc working in a sylvan setting. Looks like a really great show but probably too much to see in a day ! This show had a strange effect on me. A great location in a lovely part of the country. BUT the weather was against us - Saturday it rained and drizzled - I didn't feel like being there and today was extremely windy. I didn't feel like doing much turning - most of the punters were food monsters and nearly all the concessions were just behind us . . . However - I did manage to put a stool together and managed to rough out the rebec. I'll dry it out slowly and gradually refine it - I'll put up more pics as it takes shape. We did meet a local turner, Martin Hafner, who came along both days and brought a gorgeous screw-top box today to show us - I'd love to have a go at screw threading on the pole lathe ! I made a template for the shape of a Rebec that I have a penchant to make. Also sorted out some timber for it - Laburnum for the fingerboard, pegs, tailpiece and bridge and half a 6" sycamore log about 20" long which I'll carve into a giant spoon shape for the body and neck. Haven't got anything for the top yet - I suppose I'll have to buy a piece of thin Spruce from somewhere. I'll take some photos tomorrow at Long Melford Midsummer Craft & Country Show where we'll be this weekend . . . I chopped down a Robinia tree which had blown over in my Mum's friend's garden in Gillingham today. This has a nice hard, yellowy heartwood which is very durable outdoors (I think they call it Ironwood & Black Locust in the USA). It's a wood that I haven't used for a while and it seemed like an opportunity to acquire a couple of good logs and help someone out. Had to remember a few old tree surgery techniques as the tree was hanging right across a bed full of lovely Summer flowers. So with a rope tied to the crown and my Mum & Vanessa pulling hard I cut a side-gob and hinge and it swung safely onto the adjacent lawn. I think it will coppice and new shoots will grow as the root wasn't pulled out of the ground . . . but it's quite a nasty, spiteful tree and has vicious thorns even on the bark of big logs - watch how you carry it ! We had a nice lunch with her afterwards then drove down to Faversham to see my Dad and Velma. It's the first time I've seen him since that day in the hospital in Margate. He looks great - back to his old self nearly . . .
Well we got frozen, soaked and baked but we had a good time. Sleeping in the eco-shelters at the Youth Camp was brilliant. Friday night was very cold - a chill came up through the floor. We hadn’t taken enough blankets but we borrowed some on Saturday. After an excellent meal at The Royal Oak Hotel at Duddington with John the woodcarver and his wife Lesley we went back, lit a big fire and sat, chatted and had a drink with some of the CAT people. It was a much warmer night and we only got woken up by 3 or 4 thrushes trying to outsing each other. Which is much better than the radio alarm ! We were introduced to the dignitaries from E. Northamptonshire by Rachel Watson - the organiser of this very interesting and positive, informative, ethical and sustainable event (she is on the right). Frank who picks elderflowers for a living at this time of year . . . He lives in a wood and makes benders. Joanne, Hester & Alexei from CAT with their wind turbine and solar panels and loads of other ideas. Darren who got bitten by the bodging bug, and his wife - who got entranced by the secrets of the Whimmy Diddle. This is Darrel and Chaz learning Green Woodworking and playing at being Bodgers. We discussed making elderflower wine with Chaz and ours is now bubbling away madly. Also Susan and Frank who run the place for the Forestry Commission. I also met Phil Buckley who’s been following my blog and saw the link and came along ! He runs the website for The Ely Guild of Turners. When we got home our garden looked like this . . .
PS. nobody's got the right answer in yesterdays tree quiz yet . . .
Come on you tree buffs - name that tree ? Here's a leaf . . . The tree was behind The Youth Camp at Fineshade Wood behind these eco-shelters where we slept for 2 nights. Fineshade Wood is an ancient mixed broadleaf and conifer woodland with waymarked walks, car park and Caravan Club site. The wood contains rich semi-natural native woodland, as well as areas of conifers that are gradually being restored to site-native broadleaf woodland under the 'Ancient Woodland Project'. The wood was coppiced for many centuries, and the remnant coppice banks can still be seen. The coppice was used in the past for charcoal making, and there is evidence of medieval and Roman iron smelting in the wood. Leaflets are available from the atrium in Top Lodge, near the car park and caravan site entrance. The full story of ecoFest tomorrow . . .
We're of to demonstrate at Ecofest for the weekend. This is happening in a Forestry Commission woods in Northamptonshire. We're going to be staying in an eco-shelter which sounds interesting. - he's the head of CDT there and organises an after school woodturning club for the kids on Wednesdays. The Fairlop Woodturners Club is also based at the school and some of the members come along to give tuition. Jon recently became interested in green woodwork and attended the Bodgers Ball in Oxfordshire. He took loads of photos of different lathes and has made this one which the kids are fascinated with - only problem was anchoring the pole in that car park ! In the evening there was a club meeting and Mark Baker - editor of Woodturning magazine - demonstrated a few techniques and ideas (none of which applied to the pole lathe). Afterwards we retired to a local Indian restaurant for curry, chat and beer. A great time - thanks Jon. Been strimming the bees out of the nettle wilderness today, pruned back some trees to give a clearer space, got the suits on and had a look in the hive but they haven't made much honey yet this year. They've probably been eating it during the wet, cold weather we've been having. This colony seem really placid and contented - we probably didn't need the suits on as they didn't really notice us dismantling their home and having a poke around in there. It's bloody hot wearing them in the hottest parts of the year ! We've built a platform for a shelter and this is the view through the archway. The bent Ash on the left is going to be a great place for a hammock. Other trees are :- Rowans, Oaks, Hazel, Walnuts, Hornbeam, Pines, Larches, Cypress, Cedars, Yews, Cherries, Box Elders, Mulberry, Beech, Birch, Conker, Elms, Ginkgo, Box, Pears, Quince, Field Maples, Small-leafed Limes, Liquidambar, Willows, Hawthorns & a Wild Service Tree. That's the blacksmith's shop in the middle of the picture. Picked enough elderflower heads for a gallon of wine - to me the essence of summer. Funny thing is I can smell it now as we've put them in a bucket and poured on boiling water. Wish this image was 'scratch'n'sniff'! Had to leave early yesterday morning and it was quite an unpromising start - overcast , misty and drizzling a bit on the way to Thetford. But . . . by noon . . . I was glad I had that hat ! It's quite an alien environment - bodging in the middle of a hot field. I did have a cover but there wasn't enough space to put it up. It was a very nice Country Show with loads to see and a good set of rural craftsmen. I chatted to some very interesting people but nobody was buying anything - thank god for the demonstrator's fee again. We were right opposite the arena for the Heavy Horses so we've seen them 2 weekends on the trot now. No apologies for putting up more horse pics . . .
and especially this Suffolk Punch Mother & Child. If we ever win the Lottery (ha ha) I'll have one of these to drag logs around in my forest. We're going to be demonstrating tomorrow at Euston Park Rural PasTimes near Thetford, Norfolk. Looking forward to that . . . 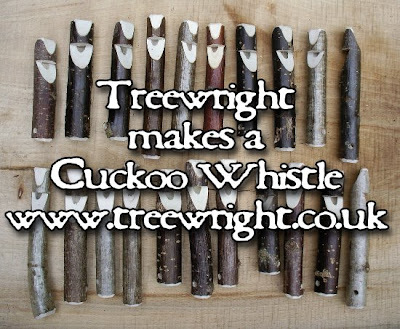 I've been doing some research on two-note whistles today amongst other things - more specifically cuckoo whistles. I had planned to do a little sequel on YouTube but unfortunately got rained off. As well as that watch this space for a bow lathe turning film on YouTube. They're starting to put these giant laser guns on the tops of all new buildings in the City of London in case of terrorist hijackers or attack from outer space by extra terrestrials . . . actually it's only a crane but it did give me a slight frisson of Brave New World or Metropolis when we first saw it on our walk from Liverpool Street Station to the Wizardry in Wood show. I like the City - it's a very interesting and exciting place with a strong sense of history. Ancient and modern buildings vie for attention plus all those from the eras in between. It's a clean place and the people all seem to have a sense of purpose, not straggling about like tourists do in the rotten old , dirty West End. We went to give Nick & Katie Abbott a bit of a break, so they could have a look round the show and do a bit of shmoozing with the Great & the Good. I turned a couple of spinning tops although I struggled slightly using an unfamiliar lathe and tools. Here's a pic of me turning on a bobbin lathe and Nick using a rounder to form tenons on the ends of the bow for a bow back or loop back Windsor side chair. Had an email yesterday from a lady who wished to purchase a "Mermaid Spoon" - she'd obviously seen it at a show and regretted not buying it. I replied that we had only made one - were unlikely to make another and that it was unique. Vanessa made it quite a while ago from an unlikely looking piece of Alder from the firewood pile. Anyway she sent us a cheque today and . . . . it swam off in her direction. Made a big batch of whimmy diddles today - they sell like hot cakes and we're doing an event on Sunday at Thetford in Norfolk - Euston Park Rural Pastimes - a new event for us this year and really looking forward to it. This is the sign from a pub very near where we live - shame there are no green men in it - they're mainly beer and skunk monsters. Tried to upload this image via ScribeFire but it wouldn't do it - took about half a minute on Blogger. Guess which one I'm going to be using in future ??? Just trying this Scribefire out as recommended by Andy Coates. At the mo' I can't see any advantages over just logging into Blogger but they will probably become apparent (hopefully). Can't seem to see my green man image from PhotoBucket? Nah, can't upload images from my computer, Photobucket or Flickr. That's really the whole point of blogging . . putting up pics. Suppose it might be all right for text only notes. Got anything to say about uploading images Andy ? Today we went to see The Herts Heavy Horses Show & Festival of Leathercrafts at Capel Manor in Enfield. I've always had an affinity with these big beauties but trying to photograph them with a digital camera is a nightmare. If you try to do it when they're moving (when they look really good) you click the shutter and by the time it actually captures the image they've moved on and you end up with a good shot . . . . of a horse's arse! These two Shires are pulling a plough but the furrows were going a bit wonky. Two more Shires - Fred and Archie in their finery having their harness explained. Can't remember the breed but this feisty pair were much daintier than the Shires and this was the only action shot that came out well. Apart from the Shires there was also a Clydesdale Cleveland cross, a Suffolk Punch (on the endangered species list), a Cleveland, some Clydesdales and a Percheron. I overheard a spectator say - "They're amazing these Shires - there's so many different breeds". He obviously hadn't been listening! So I award him the best of the Horse's Arse pictures . . .
A Strawberry roan Clydesdale - the "feathers" (the hairy hooves) come higher up the leg than the Shires if I remember rightly. If I'm wrong - let me know.